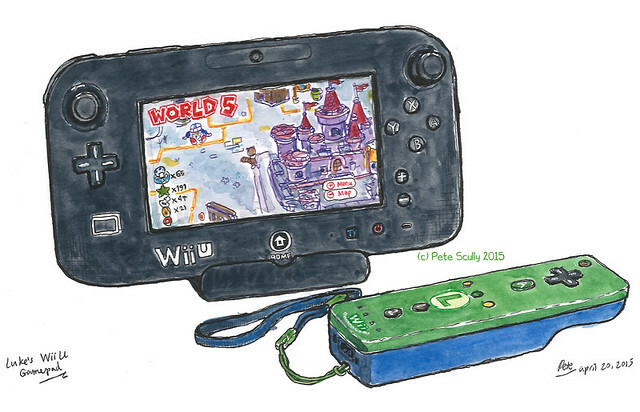 Another one from my book of my son’s stuff, this is the Wii U gamepad. He got a Wii U for his birthday a few months ago as a present from his grandad in London (cheers dad! ), and he absolutely loves it. Yeah, I kinda like it too! We have a number of games already, but the one he spends most of his time perfecting is Super Mario 3D World. I always loved the Super Mario games as a kid, but don’t remember getting through it all with such ease as he does (and I was in my teens; he is 7). When I was his age, I got my first console, a Philips Videopac game system, which was a bit like Atari, but wasn’t an Atari. It was cool though and had some great games, like Asteroids (I think it was called), Othello, um, loads of games. It was a long time ago. But I still remember the poster which had all the games listed on it, they were all so exciting, like Asteroids, and Othello, and you know, all the other ones. MUNCHKIN! That was the one I liked. It was a bit like Pac-Man, but wasn’t Pac-Man. No, Munchkin was way better than Pac-Man. There was one where you were a cowboy, and another where you played Ice Hocket, and thinking about it I might be mistaken about Asteroids, that was on a little hand-held thing I had (which was almost more sophisticated). The one I’m thinking of had red and yellow space-ships and ocasionally a crazy alien ship you had to destroy; Space Invaders it was not, but it was great. And actually Othello was called something else, Samurai or something, but it was pretty much the same as Othello, I think. Oh it was all brilliant, simple thick pixels, primary colours and black backgrounds. The games were impossible to find, however, except at the odd car-boot sale. Not long afterwards, my dad got me a Coleco-Vision. Now the Coleco-Vision was a massive step up in terms of graphics and game-play. It also had this weird ‘joy-pad’ – not quite a joystick, it also had some buttons in case the need for typing ever came up. The Coleco-Vision was a huge hit though, even though we didn’t have many games. We had ‘Turbo’, which with the steering wheel and pedal was one of the best arcade racing games of its day; there was Smurf, which, well the less said about that one the better; Donkey Kong, which was the first real classic game we had, and finally Donkey Kong Jr. The last two got a significant amount of game-play in my bedroom, despite being really quite simple and not exactly full of variation in screens. You just jump over things and get to the top, get all the bananas or whatever, make it to the next screen, and keep going over and over again. And over and over and over again. And over and over and over and over again. Now it’s worth pointing out that all of this gameplay over and over again didn’t actually mean I was playing it, rather my older brother was. He was ten years older than me (he still is, to this day) and used to play it for hours and hours and hours, often with his mate or my uncle, usually sat at the end of my bed. Waking up at 2am on a schoolnight with my brother sat there playing ‘Donk’ as he called it. He also spent many hours in the chip shop in Burnt Oak playing Space Invaders, so he had more form than me. Despite the limited number of screens in Donkey Kong it never seemed to get boring; the idea was to ‘clock’ the game, that is score as many points as possible until the points counter was reset, without losing all your lives. I must admit I am glad the games nowadays are that bit more sophisticated. Fast forward past my sister’s NES (original Nintendo) and my SNES (Super Nintendo, with many years of original Mario Kart), plus the odd GameBoy and Ps1, with a little bit of Championship Manager thrown in, and here we are in the modern age and I still feel decades behind. I’m not a ‘gamer’ and there are whole universes of online games and platforms I do not even wish to understand. So with this Wii U, with these amazing games like Disney Infinity (I’m becoming a little bit obsessed with building in the Toy Box), I am sure my son feels the same way I did when playing Munchkin back in the early 1980s.